Recipes that a century ago would have been the apogee of culinary chic may no longer be prepared because they are no longer in vogue; they may be considered unappealing, outdated, or unhealthful. 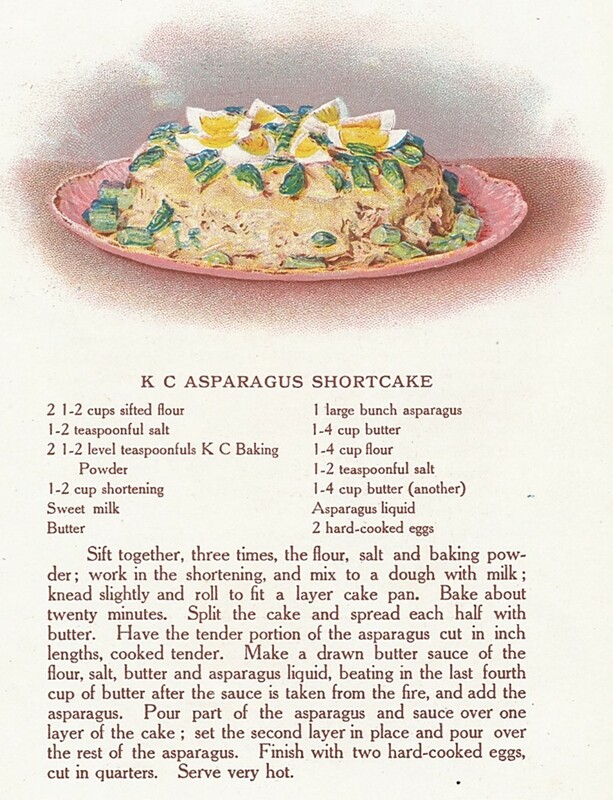 So when I saw a colorful illustration for Asparagus Shortcake in a hundred-year-old promotional cookbook published by the KC Baking Powder Company, my curiosity was piqued. Was Asparagus Shortcake an example of a food that once had been at the “apogee of culinary chic”? When I made this recipe, I worried that my husband and I won’t like it, so I only made half a recipe so that I won’t have too much left-over. The verdict: Asparagus Shortcake gets high marks for the “wow” factor when served. And, while the combination of asparagus and shortcake seemed a bit odd, the dish was tasty. The asparagus in its rich butter sauce worked well with the shortcake. Overall, Asparagus Shortcake made a satisfying lunch. Preheat oven to 425° F. Grease and lightly flour a 6-inch round baking pan; set aside. In a mixing bowl, combine the 1 1/4 cups flour, 1/4 teaspoon salt, and baking powder. Cut in the shortening; then add the milk. Stir gently with a fork to create a dough. Place on a pastry cloth or other prepared surface, and gently knead for 15 seconds; then shape into a 6-inch round disc and place in the prepared baking pan. Place in oven and bake 20-25 minutes or until the top is light brown. In the meantime, put the asparagus pieces in a saucepan and add water. Using high heat bring to a boil. Cover and reduce heat; simmer for 2 minutes. Remove from heat and drain (reserve liquid). In another saucepan, melt two tablespoons butter using medium heat, then stir in the 2 tablespoons of flour. Add the asparagus liquid while stirring constantly; continue to stir until the sauce begins to thicken. Remove from heat, and immediately stir in an additional 2 tablespoons of butter, then gently fold the cooked asparagus into the sauce. To assemble the shortcake, split the baked shortcake. Place the bottom half of the shortcake on the serving dish and then spread with half of the asparagus sauce. Cover with the top of the shortcake and spread with the remaining sauce. Garnish with hard-boiled egg quarters. Serve immediately. Posted on March 26, 2017 March 25, 2017 by SherylPosted in FoodTagged asparagus, recipe. Now, doesn’t this sound interesting!! It’s definitely an interesting combination of foods. Today, we’d never think of serving shortcake with a vegetable. That’s what caught my eye! Wow, I love asparagus, so will have to consider this. If you give this recipe a try, you’ll have to let me know what you think of it. You’re welcome. The halved recipe definitely made a more appropriate amount of shortcake for me. Well, I’m not exactly enthusiastic about asparagus, although I eat it when it’s in season. But to waste a shortcake on asparagus and hard-cooked eggs? I’m not sure about that. On the other hand, it’s really just a variation on creamed eggs on toast, which I love. So, I might start by making my sauce a little richer, and adding asparagus to the creamed eggs. If the taste combo is a good one, I’ll try this. It surprised me that the recipe did not call for putting any milk in the sauce. The liquid from cooking the asparagus was instead used. When I made this recipe, I wondered how it would work to steam the asparagus and then substitute milk for the asparagus liquid – but I didn’t try it. I also like many more vegetables now than what I did when I was a child. It’s really interesting how tastes change over time. This recipe does sound strange, but it looks really good. Asparagus can make almost anything better (except for maybe a jello mold!). Your photo is certainly more appealing than the 100 year old illustration. Thanks! – it’s nice to hear that you liked my photo. The old drawing is a little strange. Interesting recipe! 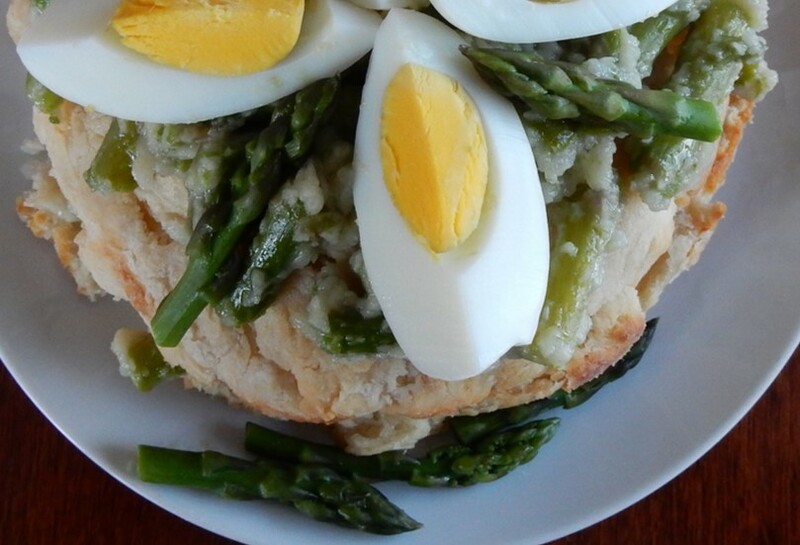 Asparagus is classically paired with hard boiled eggs, and I like the idea of the shortbread with it. Perhaps this dish just needs a different name. I think that people tend to have the preconception that shortcake is a fruit dessert – but once I moved past that, I was able to enjoy this dish on based its own merits. Hmm. Interesting, but not immediately attractive. Asparagus won’t be in season here for another month, so I have time to think about this! I like asparagus, but John is not overly fond of it. This might be an excellent compromise recipe. Your photo has that snap of color that makes it most appealing. It does have a nice sunny spring look – though I’m not sure that I’d make this recipe if your husband doesn’t care much for asparagus. John will eat asparagus, but not with gusto. How interesting and it does look very delicious, it’s just the name that’s a little strange! I have to wonder in 100 years if our dishes like “Loaded Nachos” will be received with a strange look! The eggs worked for me, but bacon sounds good, too. Thank you for the smaller recipe. I’d love to try this but wouldn’t want to have a lot leftover if Mr. C didn’t like it. It’s encouraging that you and your husband both liked it! And we just bought asparagus! You’ll have to give it a try. If you make it, you’ll have to let me know what you think. Other readers always find it useful to hear about other’s experiences with these old recipes. It’s an intriguing combination – though I like all of the components separately. What a delightful unique dish. I’d love to know whether this dish was considered unique a hundred years ago when the recipe was published, or whether it was a relatively common dish back then. Intriguing…… It sounds worth trying! It’s an interesting recipe. The combination of ingredients is a little unusual, but it made a satisfying lunch. What a strange combination! I love both asparagus and shortcake and I would definitely never think to put them together. Interesting that you really liked it. Before I made it, I worried that I won’t like it, but the dish actually made a good lunch. Your up-to-date photo makes it look really yummy. I bet it would be good as biscuits too — that’s probably the only thing you need to do for the name, call them biscuits instead of shortcake. I think that it would work well with biscuits. If I used biscuits, I think that I’d be tempted to put the asparagus pieces in a standard white sauce instead of making the sauce in this recipe. The thickness of this sauce worked well with the shortcake, but it might be nice to have a little extra liquid that could soak into the biscuits. It does seem different. Especially the hard boiled eggs. I admit I wouldn’t have thought of that combination either, but the way you describe it sounds good. It was definitely much better than I thought it might be. Oh, I’ll bet this was tasty! It reminds me of an old appetizer recipe that was a big hit years ago—asparagus and some sort of filling (might have included cream cheese) wrapped in crust-less white bread and broiled for a couple minutes. This treat made me realize I DID like asparagus, after all! Now that you mention it, I think that I’ve had asparagus hors d’oeurves within the last year or so that were a more modern version of what you described. I think that the hors d’oeurves I had were made by putting asparagus and a sauce in puff pastry.